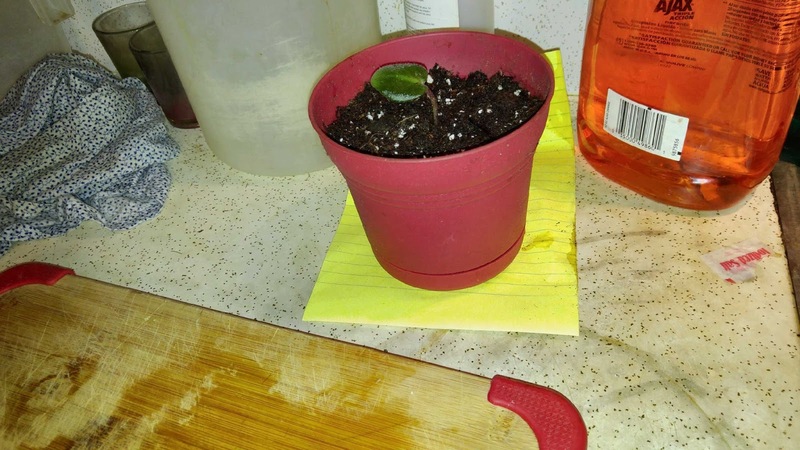 This one lonely leaf is a cutting from an African Violet plant my mom has. I took four leaves from it last time I was up there and kept them in water until they had several roots. I put one leaf in each pot. The single pot went to work with me and the other three pots are sitting on my window sill at home. Hopefully the dog does not knock them down! 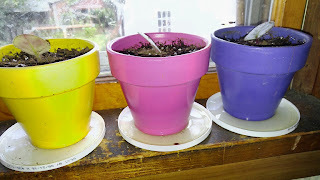 Those three painted pots are going to be Christmas gifts, if the plants take off. Well, two of them will be, I'm keeping one for myself at home. I don't remember where, but I picked those pots up at a garage sale of the thrift store for pretty cheap. I figure I will give one to Johanna and one to Olivia at Christmas. My great grandmother used to raise African Violets. She had quite a few of them and they always did very well.